Eight new members of Killara WBC played lawn bowls in the World Masters Games in Auckland this year. They entered as two teams of fours in Women’s 50-59 years category. Team 1 – Judy Reddy, Sally James, Susie Meares and Tina Hunter – won 2 of their 3 pool games, which was unfortunately not sufficient to progress to the next round. The game they lost, 11-5, was to the eventual Gold Medal winners. Team 2 – Marina Watson, Michelle Olsson, Claire Hovey and Helen Adams – won 1 of their pool games. 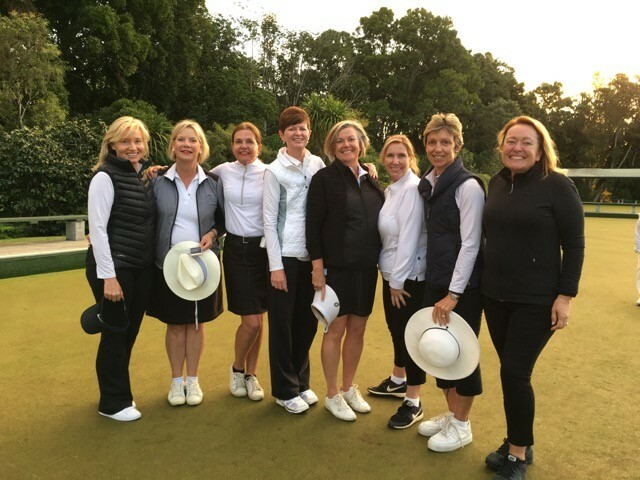 The ladies also played Women’s Pairs 50-59, and some played Mixed Pairs 50-59, but didn’t get past the pool rounds in any of the events. In the mixed event, Susie and her partner won 2 of 3 pool games, losing the other game to the eventual gold medallists. Susie reports it was great to play such experienced and skilled players, and also good experience playing on fast greens – 18 seconds – at Carlton Cornwall and Mt Eden Clubs. When not bowling, Helen, Marina and Claire also ran in a 10k road race. Great to have these enthusiastic ladies in the District! !